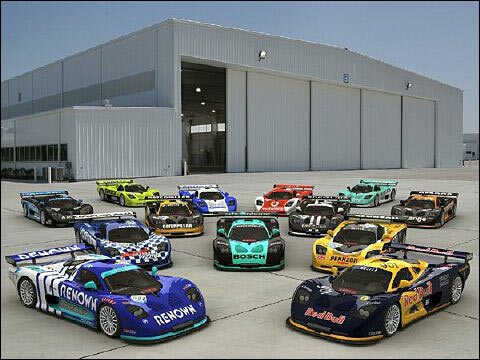 There are likely to be at least four of the MT900Rs racing in Spain this year. Roger Marketing and GTA Competition will continue to race the chassis they each raced in the Spanish GT Championship in 2005, while the former Balfe FIA GT car has found a new home, with Luis Villalba's Motor Competicione. In addition, a brand new chassis has been ordered by Pepe Santos at Saturn Motorsport. Meanwhile the 'car' we showed on the streets of Berlin recently - here and above - was, as some of you guessed, not a real Mosler at all, yet. It will be though. It's been ordered by a German customer, Harald Mecke, racing series yet to be identified. 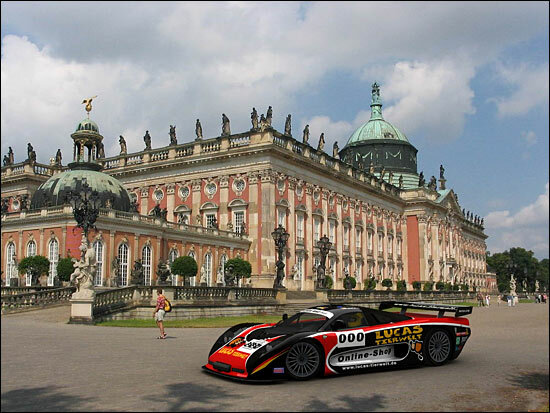 The livery of the #000 Mosler, and its 'placement' in Berlin, were created by the clever people at Verheij Design, who also come up with the graphics for PC games. The clue in the image above is the passer-by, completely ignoring the empty space where the Mosler 'sits'. Verheij Design also produced this image, below - 13 'Moslers' sitting in front of a hanger. Production of the MT900Rs is going well -- but not that well! "We're producing one road car a month, at Breckland," reports Martin Short. "There are six cars in production now, and one of the first cars has been bought by a member of the Royal Family in Brunei, and another one is heading to Germany. Our German distributor also has the 7 litre car, preparing for an attempt at the road car record at the Nurburgring." Back to the race cars - and there are still four chassis in the UK (Kevin Riley's newly acquired ex-Cadena chassis, the Eclipse car, the Woodcock brothers' car and Rollcentre's own chassis), while another one, a new race car, looks as though it could be destined for the Belcar series this year. Martin Short will be entering the Rollcentre chassis, the 2005 winner, in the Britcar 24 Hours again - "and it's available for the EERC V8 series, and Britcar," points out Martin Short. "You can buy a Mosler for two-thirds of the price of a Porsche and run it at one-sixth of the cost - for example an engine rebuild is £5,000." Rollcentre will be running Kevin Riley's MT900R (for he and Ian Flux) in the British GT Championship this year. And just to complete the list of racing Moslers, there's another one racing in Japan.